Bad weather happens, halfway through the Camino de Santiago or midway down a rappel route on the back of Snowpatch Spire. The Outathere Jacket adds a protective layer to your alpine set up or your travel pack. 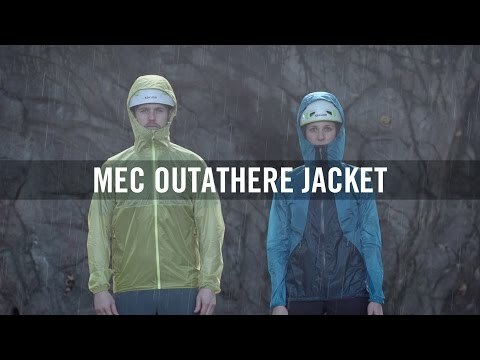 Made of ultralight, packable Pertex, it won't take up too much room in your pack, but when the rain hits, the waterproof fabric and taped seams will keep you dry and protected. An adjustable hood, streamlined cut and articulated elbows let you keep moving on and out even through the worst of the weather. 2.5 layer Pertex Shield fabric has a hydrophilic film that's fully waterproof and moderately breathable (not ideal for sustained, daily use). Taped seams provide full wet-weather protection. 3-panel hood has 2 volume adjustments and a stiffened brim to block out wind and rain while allowing you to see clearly. Waterproof front zip has an internal storm flap to keep out driving rain. Articulated elbows for better range of movement. Centre back length is 71cm. Care instructions: Close all zips before washing. Do not use fabric softeners or bleach. Rinse thoroughly. Tumble dry low. Steam iron at medium temperature. Do not dry clean.